Aspen Pumps, the global leader in design, manufacture and distribution of condensate removal pumps, presented a cheque to Mikayla Bernstein, Corporate Fundraiser at Chestnut Tree House children’s hospice on Wednesday 1 November 2017. The cheque was presented to the charity by Joe Rose Head of Group Marketing at Aspen Pumps at the company’s offices on Apex Way, Hailsham, East Sussex. 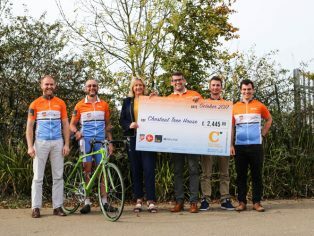 An impressive £2,445 was raised for the local charity by 11 staff members who cycled from the company’s headquarters in Hailsham, East Sussex all the way to Paris. The intrepid team covered 130 miles in just 24 hours, finishing at the headquarters of Aspen’s Paris based distributor, Salina SAS. 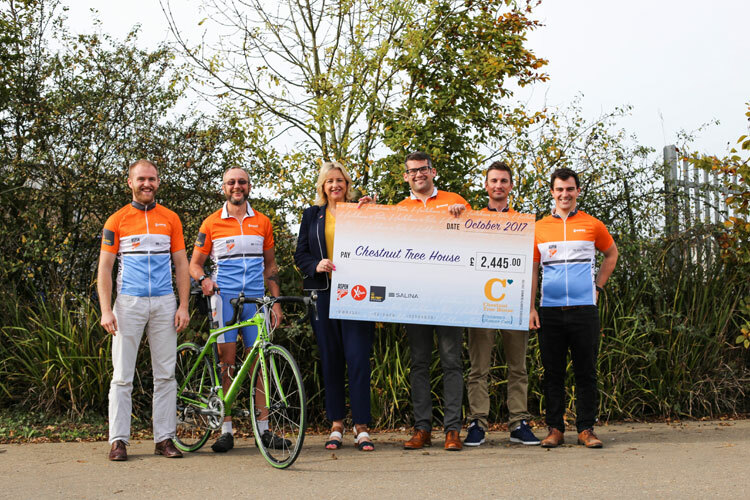 A number of the cycling team attended the cheque presentation. Chestnut Tree House’s goal is to provide the best quality of life for children, young people and their families, and to offer a total package of practical, social and spiritual support throughout each child’s life, however short it may be. Find out more at www.chestnut-tree-house.org.uk/handsup.